Ferguson Hill FH009 review | What Hi-Fi? Not for Ferguson Hill the ‘me too’ mentality. Its interpretation of a home cinema speaker system, this FH009, uses two of the horn-loaded loudspeakers the company’s long been an advocate of, alongside a sizeable subwoofer/amplifier. No other company offers such an arresting visual statement when attempting to better the sound of your flatscreen TV. 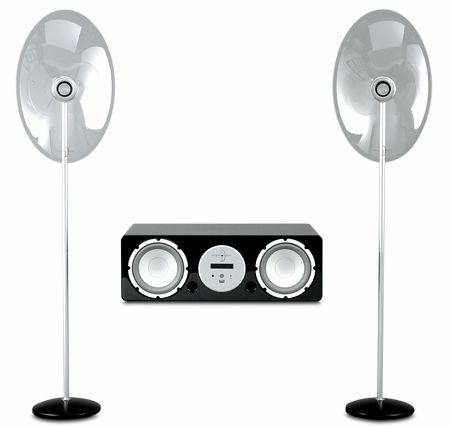 The system comes with two two-piece speaker stands (so the horns can stand on a shelf or on the floor), speaker cable (narrow enough to fit inside the slender stands) and a pair of analogue interconnects. The sub/amp itself features a pair of 13cm drivers, two pairs of RCA line-level inputs, a 3.5mm jack and a fascia-sited USB slot. The total power output is 130W, divided equally between speakers and sub. Logistically, the FH009 isn’t quite the minimalist’s dream Ferguson Hill imagines. The sub/amp unit is 56cm wide and 36cm deep; parked beneath your telly it rather negates how slim the screen is. And because the horn-loaded speakers don’t contribute much once midrange becomes bass, the sub has to work higher up the frequency range than your average unit. This makes positioning it critical – to form a cogent stereo image, it needs to be between the speakers. And placing it on your kit-rack is out of the question, what with all the vibrations it produces. Connectivity comes up short, too. Your TV, set-top box, disc player or games console all have digital outputs – but the FH009’s analogue-only inputs mean your source must handle decoding. In action, the FH009 sounds as disparate as it looks. The speakers do sweet, detailed midrange, and at the top end they shine without much hardness. The sub, on the other hand has a languor that’s at odds with the speakers’ alacrity. The result is a sound that’s just mismatched. For £800, we’d hoped for an alternative to class-leaders rather than a succession of trade-offs. You can (and should) buy better.